The four colours of the flag each have significance. and White symbolises the snow-white beaches as well as the purity of the hearts of Aruba's people, who strive for justice, order and liberty. 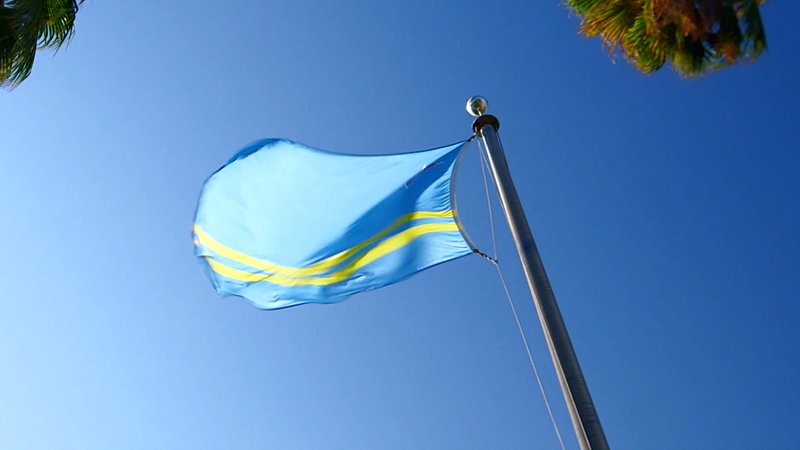 The symbols on the flag of Aruba consist of a red star and two yellow stripes. The red star represents the four points of the compass, with the island having drawn people from around the world. The star also represents the island itself, surrounded by the beautiful blue sea. The horizontal yellow stripes denote the free and separate position Aruba enjoys within the Kingdom of the Netherlands. We celebrate all this and what the flag and anthem of Aruba represent with the national holiday of Flag and Anthem Day every March 18. On the same day in 1986, Holland accepted Aruba’s right to autonomous status within the Kingdom of the Netherlands. Aruba’s Flag and Anthem Day is a holiday to commemorate our journey as a nation and everything the Aruban flag represents. It is also a day to enjoy great local food and fun traditional activities with friends and family. If you’re in Aruba on March 18, be sure to check out the many cultural events taking place.